Denis Michael Rohan who in 1969 brought their cult religion (and Australia) into international notoriety when he started a fire in the Al Aqsa mosque in order to hurry up apocalyptic end-time events. Australian Radio National has what looks like a fairly comprehensive archive of interviews, videos, images, literature, court proceedings about Denis Rohan and what can lead a person to do such a thing. See their Background Briefing archive Rohan and the Road to the Apocalypse. I suspect members of the Herbert Armstrong cult (Radio Church of God) at the time were more focussed on what the publicity meant for them — cultic fear of persecution and all that — to have noticed that this one time one person crazy event had a profound significance on Arab politics vis a vis the State of Israel. This is discussed in the Background Briefing archive. 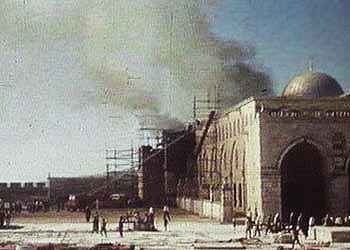 It appears that the threat of the destruction of this mosque actually catalyzed a united front on the part of the Arab states that not even the 1967 war only two years earlier had failed to accomplish. One interesting point that emerged (new to me at any rate) was the notion of the Jerusalem Syndrome. Apparently (unsurprisingly) there is something about just being in the vicinity of Jerusalem that can activate unstable mental tendencies in some. You can either use religious language to make people more extreme, make people jihadists, or you can try to in the case of Islam, you can try to emphasise more moderate beliefs in the Qu’ran, more moderate traditions. So this is the very interesting thing of religion, that people tend to regard religious beliefs as very absolute, they mean one specific thing. But in reality you can do many different things with it. Somebody might have been able to convince Denis Rohan that that you shouldn’t act upon your beliefs, this is something allegorical, instead you should pick flowers in this and this garden , and one might have been able to convince him. I think what you can learn from these cases, religion is very flexible, it can lead to the most aggressive destructive behaviour and it can also lead to more quietistic behaviour. The Jerusalem Syndrome is an instance of people who act in a very strange way on certain religious discourses and stories, which of course religion has, especially in Christianity, you have the Book of Revelation, in Judaism you have this emphasis on the Temple and the hope for the restoration of the Temple. So our religious scriptures offer these extreme possibilities. I think basically you can manipulate these for the good and for the worst. It appears Rohan was converted to the beliefs of the Radio Church of God by well-meaning members while he was in a mental institution. Rohan came to see himself as The Branch prophesied to become king over Jerusalem — partly as a result of a message given from the “Rowan tree” outside the window of his mental institution room. I seem to recall a rumour that he also found his name in the Bible as Nahor, which of course was the Hebrew right to left reading of Rohan. The interesting potentials that can arise from our propensity to look for and find patterns around us! Background Briefing also includes an interesting article by Scott Lupo, University of Nevada, describing one of the processes by which Armstrong persuaded many to join his church. No doubt Rohan found religion helped him become an outwardly healthy person in many ways, giving him a sense of purpose in life. But like so many things dear to humans, it is also a two-edged sword. 10 Stunning Photos That Will Infect You With The Travel Bug! Posted on 2009-09-06 16:18:38 GMT+0000 by Neil Godfrey. This entry was posted in Fundamentalism, Religion and tagged Cults, Denis Rohan, Fundamentalism, Worldwide Church of God. Bookmark the permalink. Note 09/09/2009 — Plan to re-write much of this post in a future update — have finally caught up with some of my library and now see some misleading generalizations and possible (minor) errors in this post.